How can you not be intrigued by a series named ‘The Murderbot Diaries’? Especially if you are a fan of science fiction or have a soft spot for A.I. Though the premise alone should intrigue you, there is more to this story than just a rogue droid that has hacked its governor module. Our little SecUnit, which has termed itself Murderbot, enjoys the finer things in life: avoidance of humans and popular soap operas. But when a crew goes dark on the coms, it is up to Murderbot and the scientists it shadows to go investigate. There really isn’t a ton to say here that won’t spoil the novella for you. 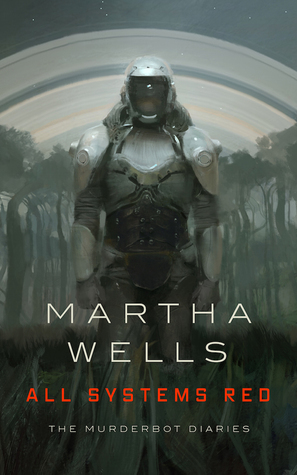 Wells does a phenomenal job instantly engaging the reader with Murderbot and intricately dives into the inner workings of it’s thoughts and motivations. Though the scientists play a rather large role in the grand scheme of things, this novella is a character study on Murderbot that will hit home with introverts. It is a really quick read at just under 150 pages and the plot isn’t difficult to comprehend. Just don’t blame me if you fall in love with Murderbot and want more right away. I am super excited about the sequel, Artificial Condition (The Murderbot Diaries #2), which hits shelves on May 8th. This was a really fun read, I am looking forward to the next one as well. How could anyone not appreciate/enjoy Murderbot?? Right??? I want more Murderbot and then some! I thought the setting was a little fuzzy but I loved murderbot so so much that it didn’t really matter in the end. Also can’t wait for the sequels! I’ve been seeing more and more reviews of this recently, and it makes me happy so many people are enjoying Murderbot. I loved this novella, and can’t wait to read the next one!